Here's a shot of my Metalheads after probably 50+ days. 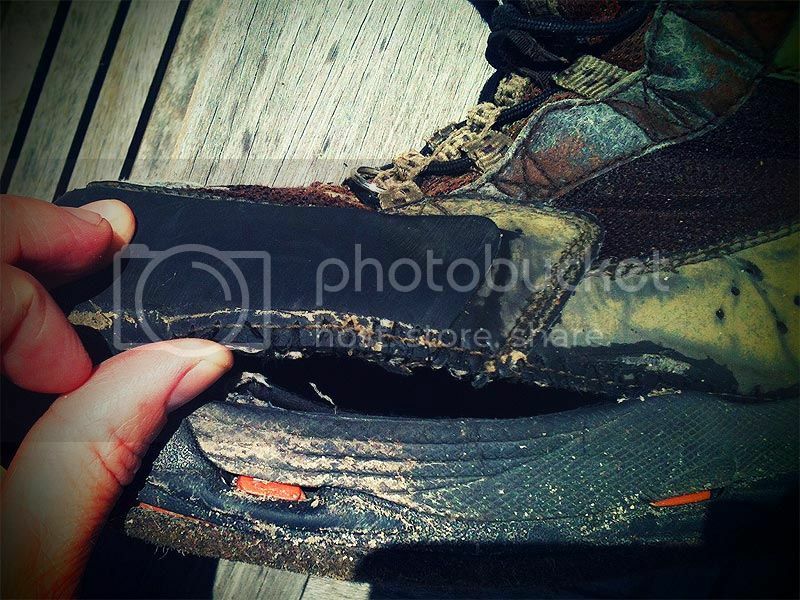 I don't think they failed because I don't take care of my gear, I like to hike and bushwhack a lot so it puts a fair amount of wear on my boots. Even the cable on the BOA system frayed and was very close to failing. If you google most of these models for Korkers you'll find a number of very similar reviews to mine. If you're an occasional angler that doesn't put too much wear on them you'll get a few seasons. If you're someone who spends a lot of time on the water don't be surprised if Korkers breakdown pretty quickly. Yes those are the photos I was remembering. They look bad no doubt. I forgot one minor detail... I don't actually fish in my boots. I only wear them when I am cooking bacon.... Maybe the cumulative grease splatter has kept my boots all shiny and well lubed. Since the original poster stated, "I want to hear if anyone has any experience in these boots or something like them. Any help would be great." I'm simply providing MY experience with the product. I don't pretend to speak for YOU or anyone else. I'm assuming that most DTA members are smart enough to know that different folks have different opinions about their gear. 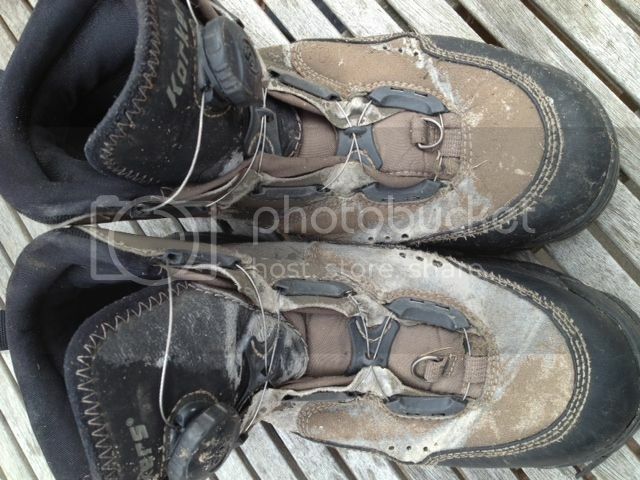 We all know that wading boot failure is not specific to Korkers (since it's a biannual discussion topic here on the forum). As an example, our leader Mark D. can burn through a new pair of wading boots like a dirty diaper, I've seen some pretty creative repair work on his feet. 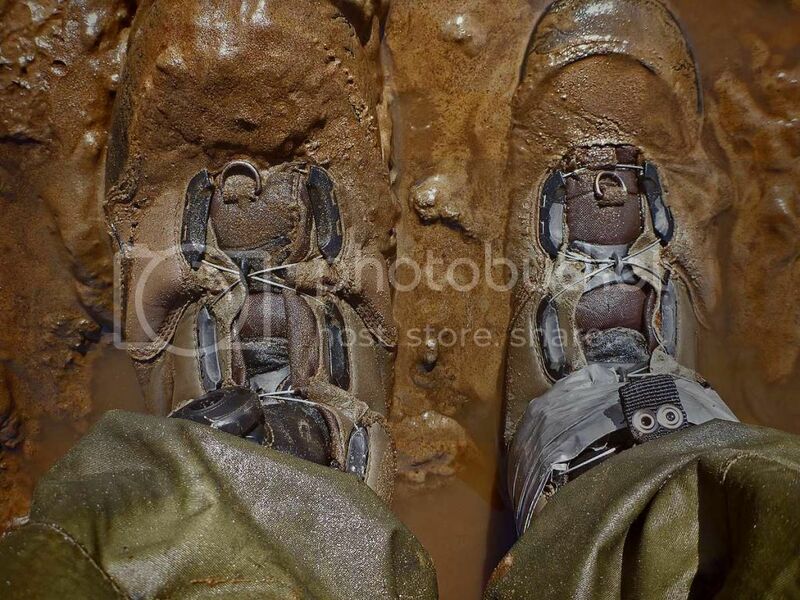 We all know that boots, like waders, all fail at some point. I generally try not to get emotionally attached to any one brand or pair, but I'm not a blatant Korkers basher either. I recommended the KGBs, even though the jury is still out on those. I was careful to use the phrase, "don't be surprised if they fail" meaning they "may" or "may not" work out for you. Don't take my word for it. Here are some other fishing forum discussions with similar varying results if you actually want to make an informed decision beyond one person's opinion. Here' another helpful hint if your BOA system jams up or you break a cable while you're in the middle of nowhere. Carry your duct tape in your car. I'm starting my 3rd season with my Korkers. So far, no failures, no disappointments. My mileage for the first two seasons totals about 20 Driftless fishing days. I bushwack a lot, exploring many hidden away places. A normal outing is about 3-4 hours each morning and afternoon, half wading, half hiking banks. Upon returning home, without fail, I thoroughly rinse the boots, and dry them before storing them in the basement. Beyond the normal wear on the soles, they still look remarkably good. I know this is not the mileage many of you put in, but so far, I'm a happy Korkers guy, and you can't beat that boa system for ease and adjustment. I bought these mid summer last year (2013) as I wanted something very light and easy to walk in, something that didn't have a big break-in period, that dried quickly and hopefully would last more than one season. I ended up with these Redington Palix River boots based on price and reviews. Used them for later half of 2013 and they don't show any signs of wear yet. We shall see what 2014 brings. The thing I guess I like best about them is they are very comfortable for long stream walks and easy in/out of. I realize they will eventually wear out, but for $79 on sale at the time it seemed to fit my needs best. I don't know if you bought your boots yet, But I love my Simms. I am very very hard on footwear and they appear to be bomb proof. 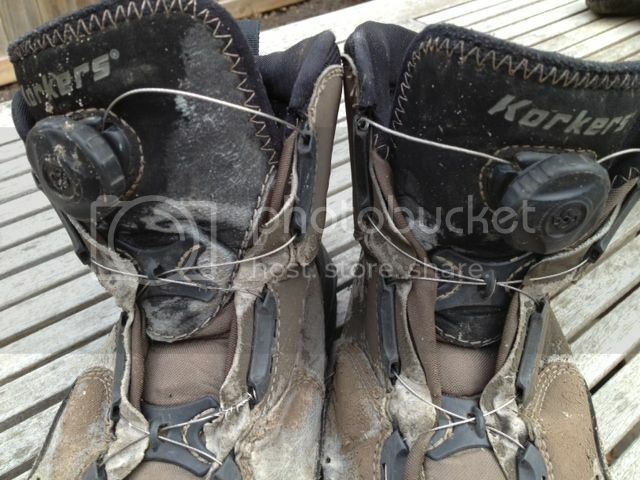 I walked about a 100 miles in them last year and only my laces are showing wear. I gave up on felt soles in driftless, too much walking and mud (I'm 240 lbs) and have gone thru felt a lot, switched '14 to Cabelas rubber bottom ($85), perfect, good grip, even did me well last fall in Mont slippery rocks. A good friend has Korkers and is always swearing at them. 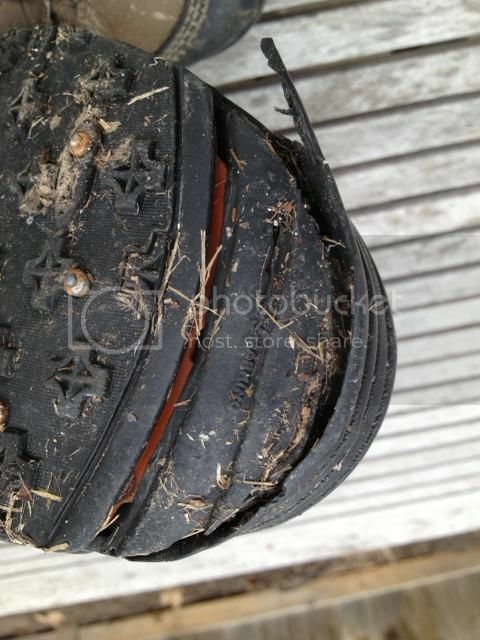 The boa has failed once, and now he is always having the detachable sole disconnect in the mud as they seem to have gotten looser after a couple years of use. I bought new Simms Vapor boots this spring and they are DEFINITELY worth the extra money. Best wading boot I have owned yet.